Ralph H. Burke (1884-1956) was an engineer for the City of Chicago responsible for almost all aspects of the planning and early construction of Chicago O’Hare International Airport until his death in 1956. He was born to a well-known Chicago-based judge, Edmund W. Burke, and entered Northwestern University to study law, but left after only two years to study engineering at the Massachusetts Institute of Technology, where he graduated in civil engineering in 1906. Burke was part of a group of young engineers hired by Robert R. McCormick (1880–1955) during the mogul’s short tenure in City Hall before becoming the owner and publisher of the Chicago Tribune. Burke worked for the City of Chicago and State of Illinois in 1906 until he opened a private practice in 1946. His accomplishments as a municipal engineer are numerous: he supervised the construction of Meigs Field; built the underground parking lot of Grant Park, the largest of its kind in the world at the time; completed work on the State Street Subway; and participated in the planning of the expressway system around Chicago and its subways. His elegant North Avenue Pedestrian Bridge, which connects Lincoln Park over Lake Shore Drive to the Lake Michigan beachfront, remains a visible part of his public works legacy. Burke’s primary contribution to civil engineering in Chicago, however, is his participation in the earliest phase of planning for Chicago O’Hare International Airport. His involvement in the O’Hare project dates to 1944, when he designated the World War II-era Douglas Aircraft Plant as the location for a new airport and was integral to the acquisition of the land by the city. Burke’s foresight in acquiring a large amount of land for the airport allowed for the construction of long runways, which eventually accommodated jets traffic in the following decade. As part of his private practice, Ralph H. Burke Associates, he developed the master plan for O’Hare Airport. 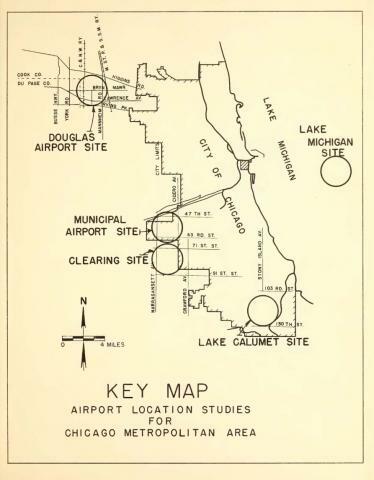 The master plan, published across several documents, includes proposals for tangential runways, an innovation which allowed the placement of passenger terminals in the center of the field; an underground fueling system; passenger terminals buildings; road access to the airport; and a direct rail link from the airport to downtown Chicago. Much of Burke’s master plan was implemented, and certain elements, such as highway and mass transit access, are easily recognizable in the present-day airport. Mayor Richard J. Daley, Sr. chose C.F. Murphy Associates to continue work after Burke’s unexpected death by aneurysm at his home in Evanston in 1956. His fingerprint on the development of O’Hare, however, is so profound that the researcher Richard P. Doherty called the period of planning and construction of the airport from World War II to 1956 the “Burke Era” of the construction of Chicago O’Hare International Airport. "Ralph Burke, Park And City Engineer, Dies: Heart Attack Fatal to Subway Builder." Chicago Tribune 24 Aug. 1956: 9. "Ralph H. Burke." Chicago Daily Tribune 1 Sept. 1956: 10. Doherty, Richard P. The Origin And Development Of Chicago-O'Hare International Airport. [Unpublished thesis], 1970. 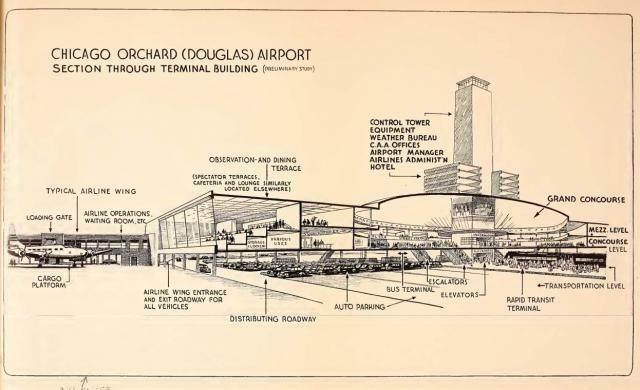 From: Burke, Ralph H. Master plan of Chicago Orchard (Douglas) Airport. Chicago, Ill. : R.H. Burke, 1948.